“You are not medically fit for transplantation, just yet” My heart sank as soon as the Dr said this. I was a bit taken back by their decision as it seemed as though they were very keen to re-list me yesterday. It almost seemed as if it was a last minute decision by the team. So the plan is to build my weight up by tube feed whilst in hospital. My weight had always been a main concern for them but they hadn’t mentioned anything about needing to bulk me up via tube. I wonder how long it would be until they are satisfied with my weight, so that they can consider re-listing again? The nurses inserted an NG tube yesterday afternoon, shortly after I received the news about listing. The medical team made it clear that I needed a transplant, and so their decision was to help me get to a safe weight for surgery. I completely understood as to why they needed​ to do this, but didn’t really see it coming. It’s become the norm for me to be underweight, that it was never really viewed as an issue to myself anymore. Ive started on 30mls feed per hour. It’s not the most comfortable treatment to receive. The tube irritates my nose and the back of the throat, but I’m sure I’ll get used to it. The plan is to keep it going day and night until discharged​. I’ve been told that this will be mid week, next week. I am to not solely to rely on the feed, so instructed to eat as normal in between. Im just going to have to grin and bear it, however uncomfortable it may be. I keep thinking about my friend Kim who is currently tube fed overnight at home. I don’t know how she does it. I just think of her if I start to moan. What a strong and inspirational young lady she is! 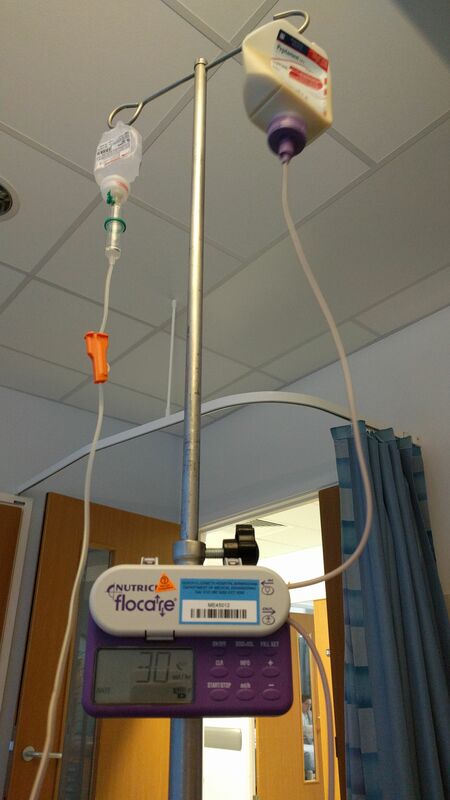 IV Tazocin (antibiotics) and feed. Previous09.06.17 – Back on the list? Next25.09.17 – A healthier, happier Me!